I love these. Will you be selling them online? Gorgeous. Your creativity manifest in so many ways. I’m sensing that letting creative spirit flow through many channels may keep the energy stronger. There’s something so liberating about using hands and getting away from words for awhile. Here’s hoping that all your glorious creations find loving homes to go to after the show. Thanks, you two. anhinga, I wanted to see how they sold at the show tomorrow and depending on that, I might put some online. These are such tiny canvasses, 3″ x 3″, and so I mounted them onto a mat and then framed them with a black frame that I spray-painted and varnished. They look cool, but I might instead move to a slightly larger size that can hang alone without a frame. I’ll keep you posted. Sharon, so true about using ones hands and getting away from words. For awhile, as you say. It’s meditative. I can stay up so late just losing myself in the art, and it’s not big stuff–it’s all very tiny and focused. I should set aside a night each week just to do my art. I would get so much done. But as it is now, I cram and then burn myself out. Thanks for sharing these. I wish I lived closer to stop by the cookie place. I’ve also been thinking it would be good to do something with my hands. To play with color and texture and actual materials. Thinking about taking an encaustic art class in the next few months. Have you experimented with this waxy art form? I hope it’s not too hard! Keep going with your love and hate…but let the love trump the hate most of the time! Just finished day one of a two day holiday art fair. Making art for art fairs is hard work, but terribly addictive. In two weeks I’ll have been doing art fairs and festivals for a year. Not very long compared to most of the artists surrounding me. I learned a huge amount this year – six outdoor and a couple of indoor shows. The economy is really making it hard on the artists I’ve talked to every weekend I’ve had a show, but I’m staying with it. Because I can’t think of anything I would rather do than take photographs, print photos on traditional papers and also on canvas, and then taking my “garden gallery” on the road. I’ve decided on a three year commitment and then I will re-assess. ybonesy, hope your show was fantastic. 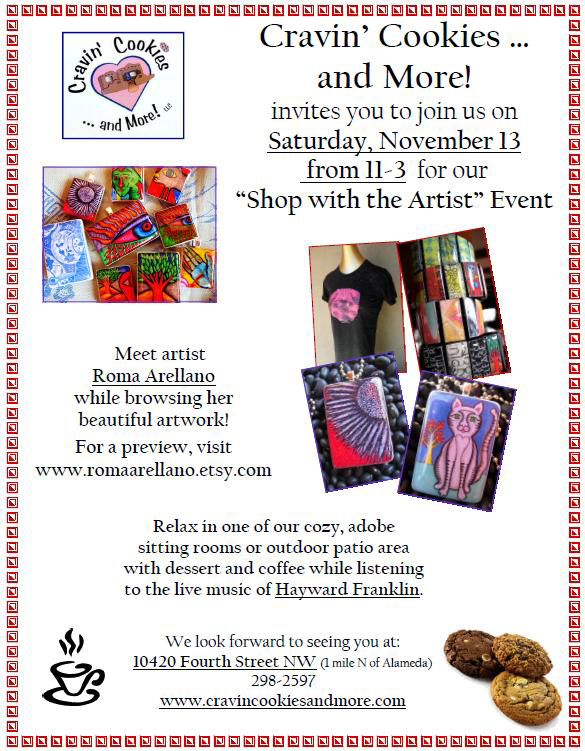 Wish I could have stopped by to say hello and take home an armful of your fantastic art. YB: I’ve watched your work evolve and it is great to watch you work in different media. I think I like the small ones. ybonesy, hope your show went well. How did the mini canvases do? Fun that you are experimenting with new media. Shows are definitely a lot of work. We have a big Casket Arts Show in the Spring where there is a lot of participation across many art buildings in the Minneapolis Arts District. We push hard to get our work ready and up for the Spring show. Tons of people, lots of chatter about art. It’s really fun. This weekend Liz and I are doing the Cache at the Casket in the Casket Arts Building. We don’t usually do the November show but decided to this year. Then my brother got his transplant a few weeks ago and I wanted to get home to see him (where I still am). The visit is wonderful but I won’t have as much art and photography up as I had hoped. Will make a rush to get things hung when I get home from Pennsylvania this week. One thing I’ve discovered about incorporating art into my life is what you mentioned about scheduling it into my life once a week. I try to get to the studio once a week but it doesn’t always work out. I’m in it for the long haul though, so I don’t sweat it. There will always be the next show. We can always come back to it. It’s not going away! I hope it went well this weekend. I was thinking about you. Hi – loved this quicky post. My favorite line: my mind goes from being a net to being a funnel whenever I make art. If you ever find the magic way to not procrastinate that which, once you begin, you love to do, let me know immediately. I need to know. Jude, I do know that after I do a big push, I have more energy and more ideas to carry me for a while, such that I’m practicing my art at least until that point where I get distracted again by other things. So I’m wondering if part of the magic way not to procrastinate is to commit to something that forces you to produce. I mean, when I look at artist friends who are making art all the time, they do so because they have shows or they’re selling their art in galleries or on websites, or all of the above. (Bo is a good example.) For me the trick is to find the right combination of commitments. Last year I pushed so hard that I felt burned out. This fall I’m bit anew by the creative bug. Shows are helpful but I can’t do too many. So it’s a matter of figuring out what works best for each one of us, I think. QM, the show was excellent. It was my best yet in terms of sales, which was great because it was only a four-hour show versus the all-day ones I’ve done in the past (or weekend ones). The mini canvasses did not sell, not a one, but two of them I’ve attached to journals and will do a post on those. I love the journals and think I’ll produce a few more. Those didn’t sell either, but last year my bracelets (which were brand new) didn’t sell at the show yet became big sellers this year. That’s another value of doing shows–you get to see what people are excited about and talk to them to understand why. 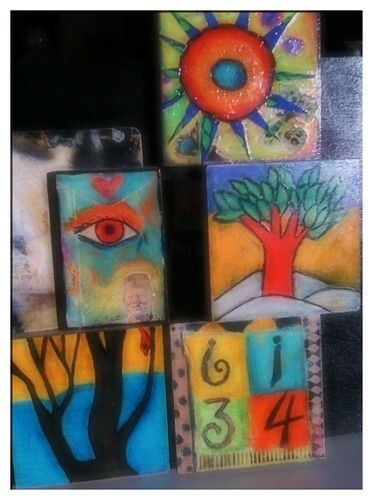 Teresa, I have not experimented with encaustic, but I was thinking as I worked on some of these mini canvasses that they have enough vibrancy that they could still shine through a wax coating. I do love the look of encaustic and have a friend who’s good at it (Sharon Bloom–she’s been a guest artist on red Ravine but not to showcase this more recent medium that she’s taken up and taken off with). Just Sunday at dinner, I suggested she teach a small group of her friends how to do encaustic. I will say that one of the challenges for me to do something like encaustic is that I’d need a well-ventilated studio, and I mean very well-ventilated. I wouldn’t want to get the wax smoldering in my kitchen, for example, even though I have lots of windows and vents there. I would only want to do it in a place like a huge art room. And I wouldn’t want to breathe in the fumes very much, which is one of the hazards with some types of art. Resin, for example, is not something I’d necessarily want to do long-term because of the potential toxicity of working with the material. yb, maybe making art is like writing: you must make time for it. Now every writing/art making period will result in a creation, but at least you show yourself that you are there for the creative juices to flow through you. It’s the showing up that’s most important. Your work has grown and changed over the years as you try new things and new images. I like the small pieces but wonder if/when you will move on to larger pieces and what those may look like. Have a friend who makes his living doing his art (computer stitch embroidery) and doing art shows from April to November. He also sells cards. He burns out on the travel to art shows, but likes creating all of the time and not working for someone else. Very interesting fellow. Bo, I’ve so admired everything you’ve done with your own art. You’ve been an inspiration, really. I’m impressed by the number of shows you’ve done this year. They are such hard work, and I mean just the physical preparation of loading the car, setting up the booth, staffing the booth, taking down the booth, putting everything away. That alone is daunting, to me anyway, much less all the prep of the artwork itself. I think in this current economy, what sells well are the more affordable pieces–for what I sell, this means items between $7 and $25. But then I’m surprised when I get several orders for the more expensive pieces of jewelry, although I’m still in the $50 range, so I guess that helps. I noticed on Etsy this weekend a necklace that I absolutely loved, it was a work of art. And priced as such–it cost $285–but I’m not about to buy it. It’s not that I don’t think it’s worth the money; I just can’t afford it at this time nor justify it if I could. And I am known to spend quite a bit on beautiful art that I love. Bob, thanks for stopping by and chiming in. Yep, you’re right, it’s so similar to writing in terms of showing up. I wonder if all creative endeavors are this way, or rather, all passions. I think even something like creating a beautiful garden, or decorating your home the way you’ve always wanted—it’s all similar. You can either sit back and fantasize about what you’d like to do, buy magazines and wish you could create the beauty that you see, but unless you’re willing to get up every day and do the work, it will all continue to be nothing more than fantasy. Regarding the larger pieces, working on the small ones left me wanting to do bigger pieces. I do have the bigger canvases already, and I do have one very large work in process that I’m ready to finish. But this very large piece that I’ve been working on for a while is done in gouache, and my style with that medium is more precise than with the wax crayons. And what I liked about the wax crayons was how loose I could be with them. I also like incorporating collage into the pieces. I feel like a lot of stuff is breaking loose inside me, a lot of creativity and desire to experiment. Which is why I need the structure to help me direct it and fulfill it.